Welcome to the Canadian Peace Initiative. How might a Canadian Department of Peace have helped in Myanmar or Syria? 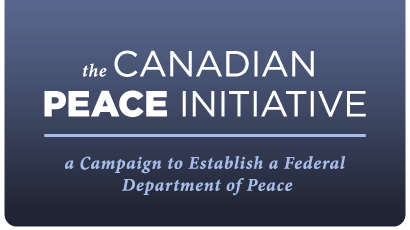 We are a nonpartisan, non-profit organization with an aim to increase the capacity for peacebuilding within the Canadian federal government. The key focus of our work is the proposal for a Department of Peace, a framework that complements our other federal departments, significantly increasing our peacebuilding capacities. Similar departments already exist in three other countries. On this site you'll find an in-depth description of how this concept works, two model Bills, a list of numerous supporters in government and beyond, pamphlets and postcards you can use to let people know about the need for a Department of Peace, and details on how to show your support. Join one of Canada’s most dynamic citizen campaigns. Canada has a greater role to play in reducing the mass suffering and death caused by war, terrorism, and violence, whether domestically or around the world. Join us in demanding that our government establishes a Department of Peace. At the macro level, when the Prime Minister needs advice when making policy or program choices around peace, there is a big vacuum. There is no strategic focus for peace in government.